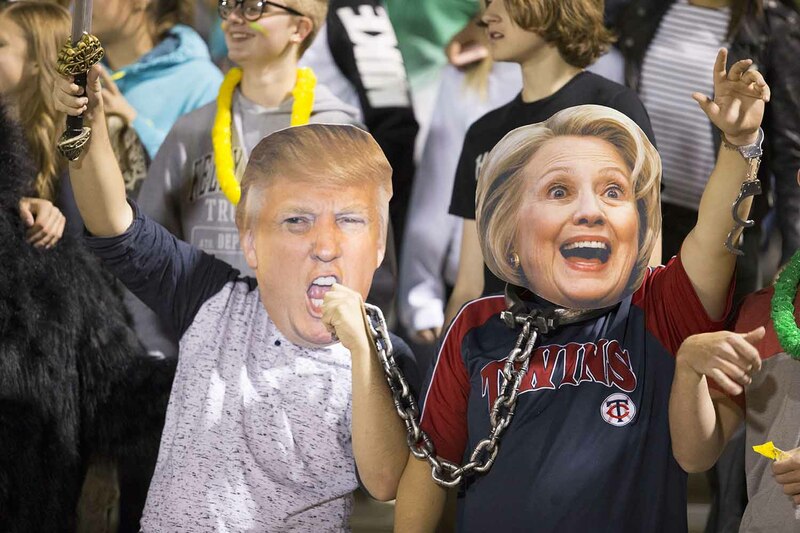 Juniors Thayne Macy and Willis Schneider don Hillary Clinton and Donald Trump masks at the home football game against Cheyenne south. The presidential election has been the story of the year nationally and locally too. Everywhere you go on the internet these days seems to be filled with presidential election discourse, but overwhelmingly there’s something we haven’t experienced so intensely from an election result for a long time, if ever: fear. Minorities, members of the LGBTQ community, women, and more all fearing for their rights and safety. People across the country and even in other countries worry that with the election of Donald Trump for our next President, America will backslide on any progress we’ve made in the department of human rights. Whether or not this will really happen remains to be seen, but the man hasn’t even done anything yet and people are already terrified. Suicides have spiked with many directly citing Donald Trump as a reason. Is this really what the wake of a presidential election should be like? People killing themselves and fearing for their lives, identities, and the safety of themselves, their family, and their friends? One indisputable fact is that no matter what the outcome, 50% of the country would have been unhappy and that is one of the major things really worries me about what this election means for the country. We didn’t really want either of them; they have the lowest approval ratings of any candidates in history. For me, and I think a lot of the rest of the country, it was about the perceived lesser of two evils and that’s not a good mindset when choosing someone you’re going to trust your country, and ultimately your safety, to for 4+ years. And I know what you’re thinking: what about my job/my parents’ job/Wyoming’s economy? All legitimate fears, but the simple fact is that we MUST make the switch to cleaner, more renewable energy and the sooner we do it, the better. Yes, there will be a period of flux and people are probably going to be out of work for a little while, but in that time they could train for new positions in a cleaner, more environment-conscious, and possibly more lucrative and stable energy industry. And if you think that I simply don’t care what happens to oil families, take into account that several of my closest friends and significant other all have parents in the industry. I understand the fear, but we simply must make a change. Going back to what really scares me about possible day-to-day life in wake of this election, I’m afraid that Trump will further feed into the sensationalist spiral that our world seems to be going down in. His campaign has already inflamed so many people needlessly, fueling bigots, racists, and hateful people to rise up once again (whether or not that was his actual intention), I tremble to see what he might accomplish from the Oval Office. (I am also simply disappointed in the country that we have so many people who would choose hate to avoid change in new directions.) But with his pathos-ridden rhetoric and…shall we say, blunt, opinions, he insults and diminishes all those around him for the most petty of things. Sound like a familiar recipe pattern? You’d be thinking of tabloids which are known for their petty, vindictive, and often false judgment of other people’s lives. Not exactly what I’d consider Presidential material. As is probably clear, a lot of my dissatisfaction with the turn our country has taken comes from concern about those close to me. I don’t want to see all my friends and family hiding their true selves because they fear for their safety and I don’t want to spend my formative years transitioning into adulthood with that hanging over me or with so much hate filling the world. We owe it to each other as fellow human beings to respect our differences and made decisions that make the world better for everyone instead of just staying in our bubbles of comfort and expecting everyone else to conform to our personal morals and beliefs. The world is diverse, and that is what makes it beautiful. Please put some extra good into the world these coming times.